On a barren piece of land in Harris County, Texas, just outside of Houston, a discouraged but determined drilling crew struck “black gold” in 1917. Weeks after paychecks from the new Crown Oil and Refining Company had run dry, “Well Number 3” finally spouted oil. However, what flowed from the well was more than just crude oil; it was the foundation of what became Crown Central Petroleum Corporation. Since then, it has evolved into Crown Central LLC. The revenue generated by “Well Number 3” enabled the young company to construct its own refinery. One of the very first refineries built on the Houston Ship Channel, the plant opened in 1920 with lube oil as its only product. But the range of products would begin to grow with the manufacturing of gasoline in 1925. That same year, the company was incorporated as Crown Central Petroleum Corporation. Led by Mr. Louis Blaustein, a group of Baltimore-based businessmen took notice of the growing Texas Company, and bought a 48 percent share in 1930. 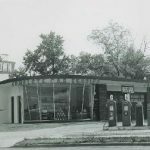 Shortly afterward, the Crown purchased a tank wagon and began to sell products through a chain of 30 stations in the Houston area. Crown tankwagon in Houston during 1930’s, ready to deliver products to our contract dealers in the area. Retail outlet in Houston in 1930’s. Gas was pumped up into the clear glass cylinders near the top of the pumps and dispensed to the cars. Five years later, in 1935, Crown went public, listing on the Curb Exchange, the predecessor of the American Stock Exchange. 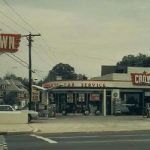 Crown’s success continued as it pioneered the manufacturing of 100-octane aviation gasoline, which the U.S. Navy utilized in its high-performance airplane engines during World War II. 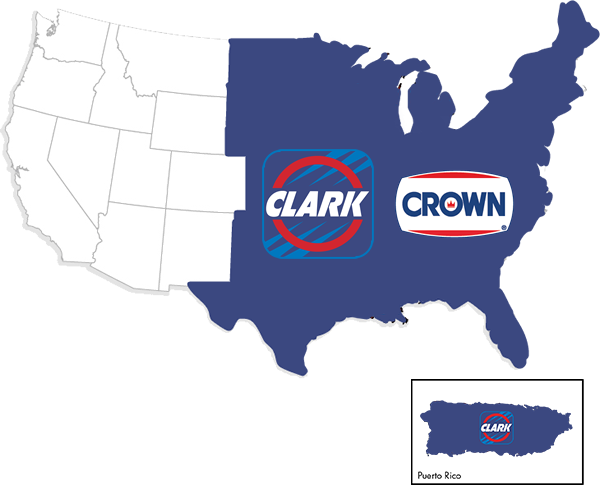 In 1943, Crown opened its first stations in the Baltimore area, marking the start of an extensive marketing campaign. 1950's Crown Bay Station with "Dual Chimneys" and "Complete Car Service"
1960's Crown Bay Station "Complete Car Service"
1970's Crown "Multi Pump" concept. Backlit Canopy Fascia and Display Fountain "Save Every Mile!" 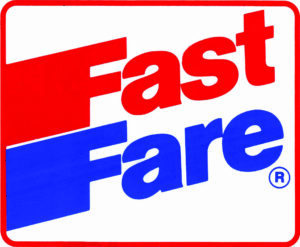 1990's Crown Station with "Fast Fare" Convenience Store with "America's Graphic"
Crown is an iconic brand with locations serving thousands of people each day in Maryland, Pennsylvania, Virginia, West Virginia, North Carolina, South Carolina, Georgia, Florida, Alabama, Mississippi, and the District of Columbia.